Tom Selman was born on the first of December, 1834 in Alabama. 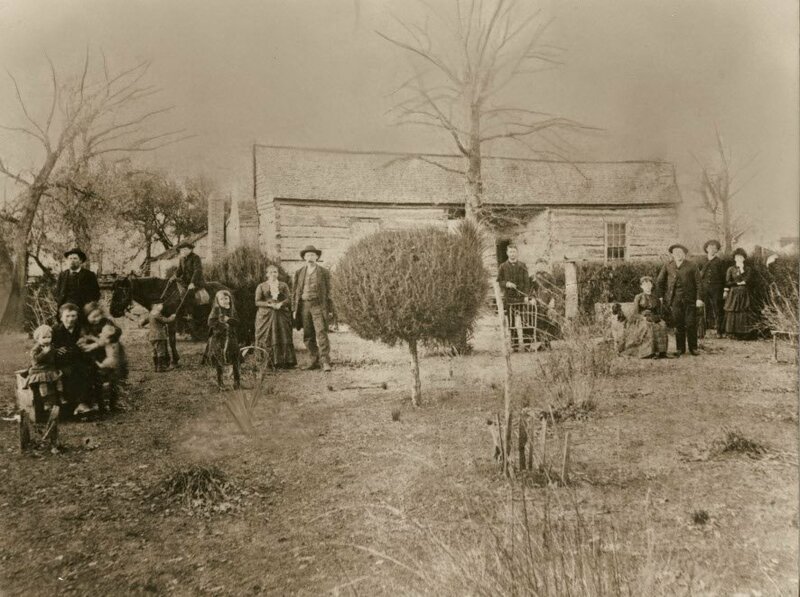 At the age of 16, he and his mother moved to Texas and in 1851, they came to Waco. 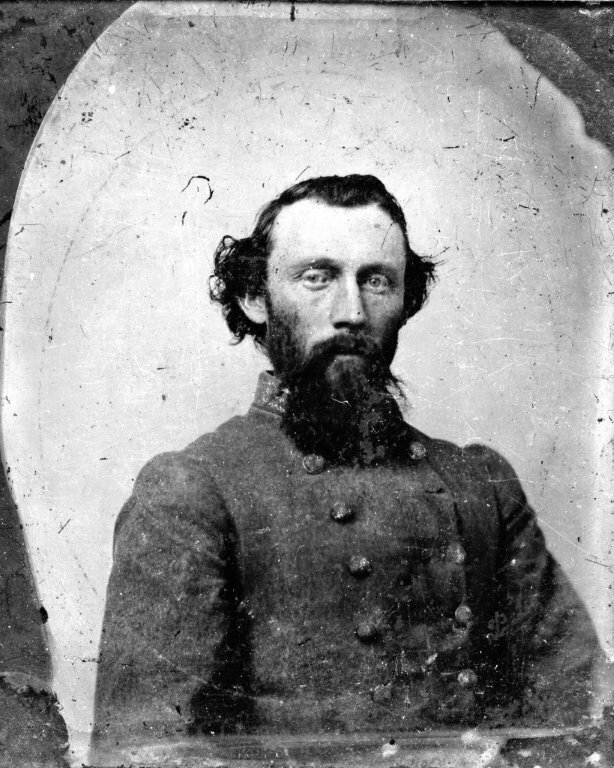 Selman enlisted with the Lone Star Guards and rose to captain of his company in Hood’s Brigade. Throughout the war, he saw action in Virginia, Maryland and Pennsylvania. In 1863, Selman was ordered back to Texas for the purpose of recruiting on account of having lost so many men to the perils of battle. Selman’s brother-in-law was Past Master James Davis. They were neighbors and Selman’s cabin was located about where the big Waco Waterworks building was later built and still stands today. This location was important as it allowed him convenience in working the post as the Suspension Bridge’s first tollkeeper. Waco had its criminals back then and so in order to avoid being robbed, Selman would lower a bucket by rope down to the bridge gate so that travelers could place there toll fees in it and raise it back up by hand. One night in 1876, Selman was sleeping in his cabin when his “Newfoundland mastiff” woke him up by barking furiously. The dog led Bro. Tom to the back of the cabin where a fire had started in the kitchen. He credited the dog with being able to extinguish the fire before losing his home and perhaps his life. Worshipful Master Speight assigned Bro. 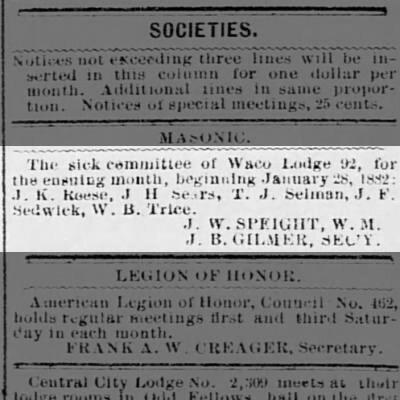 Selman to the Sickness and Distressed Committee many times during the 1870s and early 1880s. Brother Selman went on to that “House not made with hands” at one o’clock in the morning on August 23, 1885. His remains were laid to rest by Waco 92 in our portion of the First Street Cemetery. Twenty years later, he was relocated to Oakwood with his wife upon her death.